Since its launch in 2014, Vegas Crest Casino became favorite gambling destination to many players worldwide, specifically from United States. Running on the platform powered by Vista Gaming, the casino can be instantly accessed via internet browsers with no download needed. 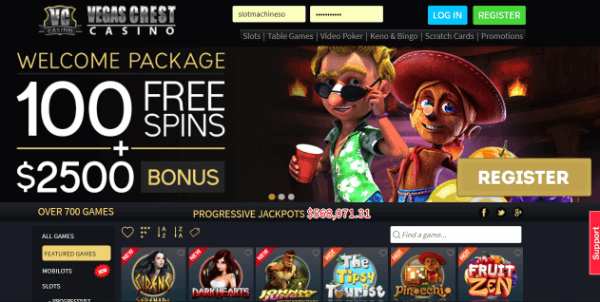 Vegas Crest offers games by multiple software providers, including Rival, Saucify and Betsoft, the latest with its 3D slots being one of the biggest attraction of the gaming venue. Welcoming new customers with a massive signup package and treating existing players with regular promotions, Vegas Crest allows gamblers to feel the genuine casino action and Vegas thrills from the comfort of their home or on the move. By signing up with Vegas Crest you become eligible for a huge welcome package consisting of 100 free spins and $2,500 in bonuses. As soon as you create a real money account you will be credited 10 free spins on the Betsoft title The Tipsy Tourist with no deposit required. To receive a 200% bonus up to $1,000 and 30 free spins on top you have to make a valid deposit. Over your second deposit you can claim a massive 300% match bonus up to $1,500 and 60 free spins on top. The winnings from free spins no deposit required have to be wagered 99x their value to be released while deposit-based bonuses including those given over the two initial deposits are subject to 30x wagering requirements. You have to wager 30x both the deposit and the bonus amount if you want to turn free cash into real money and withdraw it. To be honest that’s pretty high and there are cashable bonuses with lower wagering requirements. All slots, scratch cards and Bingo games contribute 100% towards wagering requirements whereas wagers on other games contribute 25% or less. Vegas Crest Casino also offers daily bonuses, themed bonuses and tourneys, Blackjack bonuses as well as free spins for the customers who prefer playing on the go. In addition, thanks to the generous Loyalty Program Vegas Crest Casino players can get real cash every month as a reward for the bets they have placed. For every $500 you wager you will get $1 in cash. If you play slots, Keno and Bingo or scratch cards you will receive 2 comp points for every $1 bet you place no matter if you win or lose. 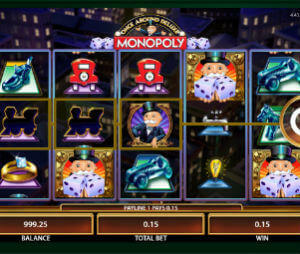 VIP players can enjoy a royal treatment along with doubled rewards for their wagers. With the technology advancements you need to install the casino software on your computer no more as gambling sites perform seamlessly thanks to reliable platforms and fast internet connection speeds. Vegas Crest Casino is no exception and as soon as you enter it you will see how it is easy to navigate and find all that you need. Android and mobile users can enjoy a thrilling gaming experience on the move directly from their mobile browser with no download of any additional app needed. nced games such as iSlots, 3D slots, chain reactors, exclusive and progressive slots, Vegas Crest offers all types of slot games which will please true slot aficionados. If slot machines are not your cup of tea and you feel more like playing the games which require certain skills, visit the Table Games section and choose from Blackjack, Baccarat, Poker, Craps and Roulette virtual tables. Video Poker variants played in up to 10 hands are also available as well as a range of Bingo and Keno games. Vegas Crest Casino supports a wide array of convenient international and local banking methods players can choose from to make their deposits and withdrawals. Some of the supported brands include Visa, e-wallets like Neteller and Skrill and the instant banking method UseMyServices. Withdrawals are processed within up to 14 days, not the fastest payout USA casino. They also may come at a fee going up to $100, so check out which banking method saves your time and money. You are allowed to cash out up to $3,000 per transaction. All your cashouts will be subject to a 48 hours pending period. You can rest assured that all your data will be fully protected while playing at Vegas Crest as it employs one of the latest SSL encryption technologies provided by Comodo. Regulated and licensed by the Government of Curacao, Vegas Crest casino provides players with high-quality gaming content in a safe and fair environment. With over 500 casino games out of which more than 350 are slot machines, the gaming venue focuses on slot lovers. They can lose track of time and space once they start browsing the libraries and playing the state-of-the-art slot titles including over 50 3D slots providing players with a cinematic gaming experience and lucrative bonus features. Take advantage of bonuses and promotions, become a VIP player and enjoy the real casino action to the fullest wherever you are. All the games are tested by an independent and trustworthy auditor while your data and transactions will be fully protected by the high security measures, so there will be no reason for any kind of worries. If any problem occurs, contact the customer support service via live chat, fax or email. Its representatives are available 24/7.